Bellingham is leading the charge in a local food revolution. The city has the unique combination of community-based values and healthy lifestyles, as well as an abundance of great local food. The fertile valleys to the North and East are bursting with vegetables, berries, dairy cows, livestock, honey, and more. Look to the West and you’ll find an abundance of salmon, shellfish, and other delicious sea creatures. 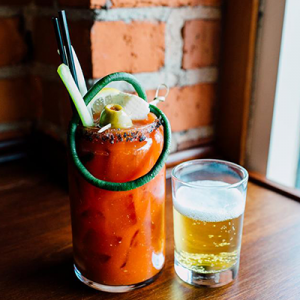 But you don’t need to look beyond the city limits to find all of these wonderful ingredients – you can find them right in town, expertly combined by chef Todd Alan Martin of Hundred North. 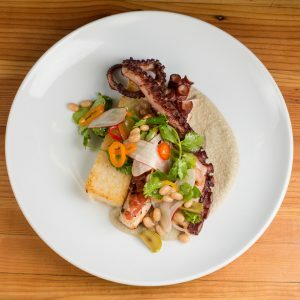 Imaginative, beautiful, and delicious dishes – like their Grilled Pacific Octopus with pumpkin seed molé, lime & garlic rice cake, breakfast radish, Castlevetrano olives, white beans, and pickled peppers. Walk into the restaurant, next door to the historic Mount Baker Theatre, and you’ll start to get a taste of what you’re in for. Owner Timothy Shea has a background in construction and it shows. A 10-year resident of Bellingham, he took his time designing the space to feel comfortable yet classy. From the beautifully handmade sign to the tabletops and fully stocked bar, exposed wood warms and brightens the restaurant’s feel. The details are what make the space. The huge picture windows illuminate the space during the daytime. After dark, the hanging Edison-style light bulbs add charm and ambiance. The setting is intimate and every seat in the house has a view of the kitchen as well as the bar. After entering, you’re likely to meet front-of-house manager Michael Duncan. A Ferndale native and a journeyman of customer service, he has a simple philosophy of hospitality: make sure the customer leaves happy. The entire staff works as a team and creates a welcoming atmosphere where anyone can come and enjoy good food and drink for any occasion. “We want to be a place where people can go for an anniversary dinner, or come in after their softball game for a beer,” explains Shea. Once seated, you have the option of ordering from an inspired cocktail list that includes drinks like the Foghorn Leghorn and the Old Biddy. You can also order a beer from one of the rotating taps or choose from an impressive selection of non-alcoholic options. The appetizers are incredibly delicious, especially their imaginative take on the classic Caesar salad which capitalizes on all of the asparagus that is in season right now. Perfectly sautéed stalks are placed on a bed of house-made Caesar dressing, and then dusted with breadcrumbs and freshly grated Parmesan. Chef Todd grew up in Spokane, spent the last ten years in Nashville, and considers himself a true American chef. 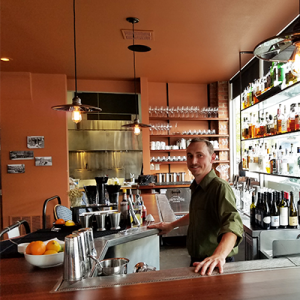 Tossing aside the stereotype of Eurocentric chefs using French and Italian styles, Todd draws inspiration from Native American, Mexican, and Central American traditions. Fry bread is a staple, and salsa and chimichurri make frequent appearances on the menu. He also incorporates his Southern roots, serving fried chicken and black eyed peas regularly. The focus on local cooking traditions is a natural fit with sourcing ingredients locally. Salad greens from Cloud Mountain Farm Center in Everson made their way onto the menu almost as soon as they were ready for harvest. Salmon is also a staple, and they buy it direct from a local fisherman. The full experience of excellent service and high quality food is all part of the plan for Mr. Shea. He talks about his lifelong love affair with cooking and eating, which began when he started making meals for his family at a young age. Ever since then, he’s had visions of opening a restaurant. Now he sees the opportunity in Bellingham for something unique. High quality ingredients within arm’s reach, coupled with relatively affordable downtown real estate, make it possible to offer a fine dining experience at a fraction of the cost one might pay 90 miles to the North or South. I can tell as he makes this reference to Cheers that it’s much more than a one-liner. It’s a philosophy that seems to be shared by the whole staff. While the entire staff has passion for the work they do, it’s clear that they want to give Bellingham something. That something is a fine dining establishment that’s still accessible. This is a place where you can get the full experience of a top class restaurant without having to fight traffic or make reservations weeks in advance. You’ll leave feeling delightfully full and cared for, impressed by the quality of ingredients, and happy to know you’ve not only supported a local business but also a multitude of local produces. That’s what dining out is all about, right?